The Great Divide: Second Thoughts on the American Dream – loudlatinlaughing – Euge! Euge! It is refreshing and almost soothing to see that the same issues we’re grappling with now have been around for a while. 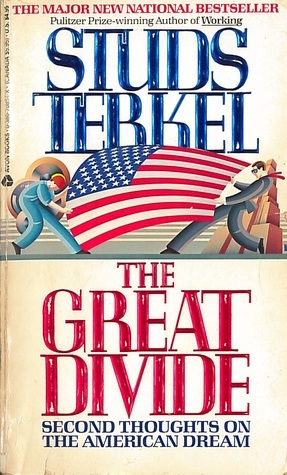 This book came out 30 years ago in 1988 and the voices sound like they’ve been interviewed today—grappling with greed, capitalism, racism, neo-nazis, ultra-religious nuts, worrying about nuclear war and quality of life declining for future generations. Somehow this takes a bit of the sting out of the slap we were dealt in 2016 with the election of McDonald Tr*mp—this stuff has been simmering for a long time, we were just in our progressive bubble and refused to see it. The only real difference is that unions were a lot more prevalent back then. Now, they’re an anomaly. And more people were actively protesting nukes. Per his usual style, Terkel interviews hundreds of folks and lets their words do the talking. Art Spiegelman kvetches about art students not knowing anything about the 1960s (“They had never heard of underground comics. Nobody in the class had ever heard of Robert Crumb. This is not the general public we’re talking about. These people are aspiring to be cartoonists…”) and he had to explain protests against the Vietnam War to his class. Another teacher discusses how censorship has morphed into people withdrawing books they don’t like from the library, “often one that is feminist in theme”, paying the fine and the book is never replaced. Another hero: Jean Gump, mother of 12, jailed for a demonstration at a nuclear silo. As part of her interview, she reveals the ridiculousness of the government, telling the story about an inmate who lay in the yard and got a sunburn then an incident report was written up for “destruction of government property” because she destroyed her own skin. “An ironic touch has been added during these past 10 years. Our life-cycle has lengthened in every decade, yet we are seeing early retirement more and more frequently… That’s the au courant phrase these days: early retirement. In some cases, it’s a euphemism for being fired. It may be a case of wanting a younger person. Or they may just do away with the job. The job is robotized or faded out. The job is eliminated. Of course, for people this age it is difficult to find work again.” – Maggie Kuhn, of the Gray Panthers, a national org militantly concerned with the rights of the elderly. Anthony Bouza is the police chief of Minneapolis: “As for the country, I honestly believe we are observing a decline of the republic. There’s a major shift in American values, between the haves and the have-nots, the rich and the poor. We are screwing the poor people.” This is also a guy whose wife has been arrested 5 times for protesting nuclear bomb-making plants in town.